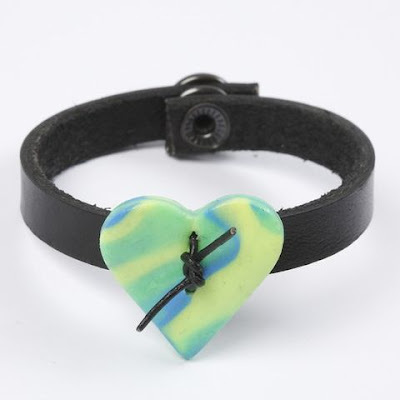 A heart made from Pardo jewellery clay attached to a bracelet. 1. 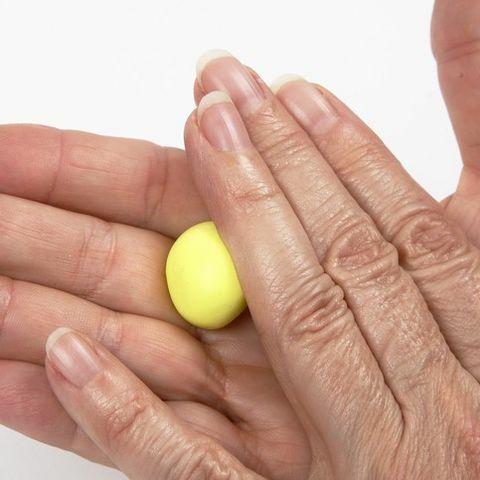 Mix different colours of Pardo jewellery clay. 2. Roll out the jewellery clay flat. 3. 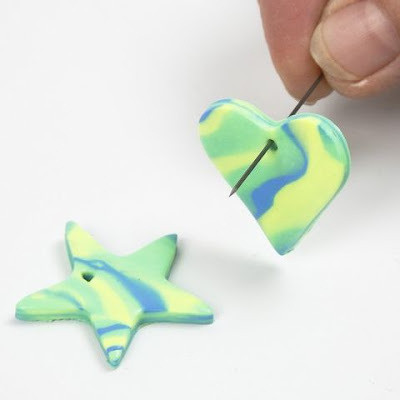 Use shape cutters for cutting out a shape from the flat rolled out jewellery clay. 4. Attach the finished shape onto a pin which is inserted into the stainless steel mitre box. NB! Make an additional hole if you which to attach the shape with a piece of leather cord as shown in the picture (text No. 9). Please note that several shapes fit onto the same pin at the same time. 5. 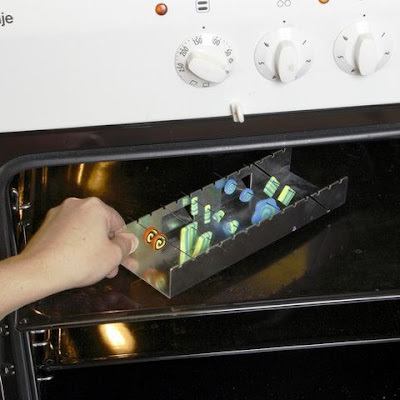 Place the stainless steel mitre box with the shapes in a 120°C warm oven and fix for 30 min. 6. 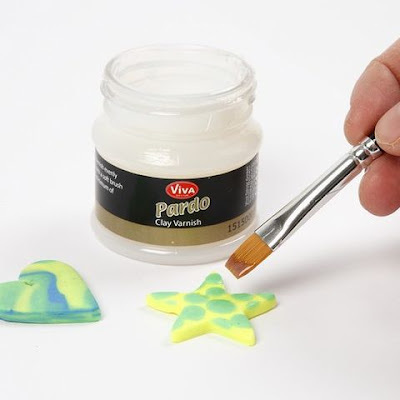 Varnish the hardened and cooled shapes with the special varnish (Pardo Clay Varnish) to protect the surface. 7. Trim the leather bracelet. 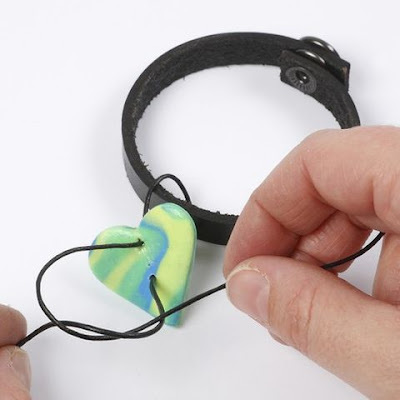 Make a hole in one end of the bracelet for the snap fastener using pliers. 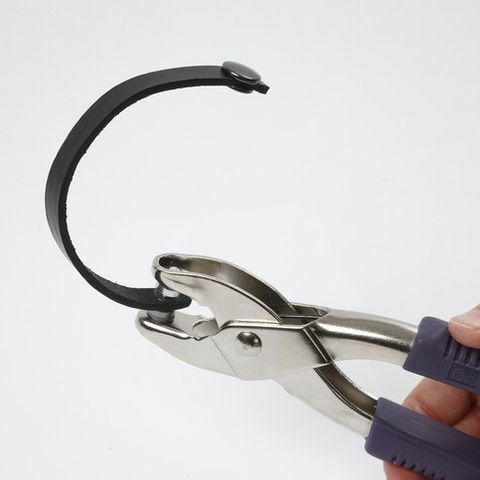 Insert the snap fastener at the opposite end, using the pliers for squeezing it in place. 8. 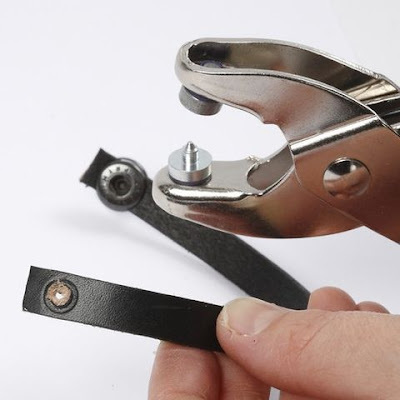 Squeeze the snap fastener into the hole using the pliers. 9. Attach the finished heart shape onto the leather bracelet using a thin leather cord.